One simply tweeted: “a fridge? How irresponsible #GBB0”, whilst another agreed: “#c4 How stupid can you be? You should never shut people in a fridge even for comic effect! Children are watching this! #GBBO”. 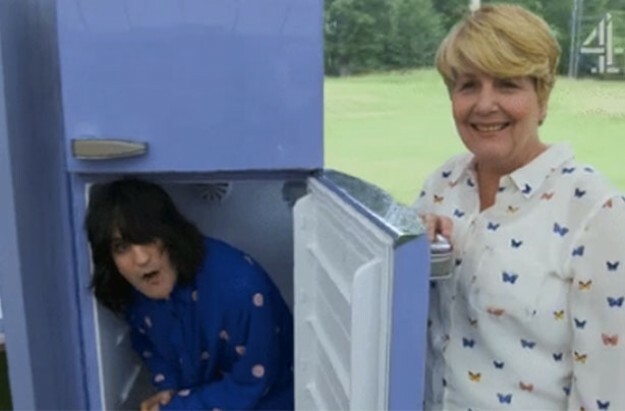 Another raged: “@noelfielding hiding in a fridge on #GBBO. Big mistake. People have died doing this. #fail”. One wrote: “@Channel4 #gbbo Noel in the fridge? Really not appropriate, kids watching,” followed by another who vented: “How idiotic can #GBBO get! Shutting @noelfielding11 in a fridge/freezer! As a mother @sanditoksvig should know better”; while a third wrote: “#GBBO irresponsible after Noel Fielding hides in fridge I cannot believe that the people responsible for this programe thinks this is funny”.